White and Red - All Over? When it comes to F1 sponsorship, nobody has ever come close to matching the hefty impact made by the Philip Morris cigarette brand, Marlboro. Reports reverberate around the F1 world that Marlboro's time in F1 may be finite. That's a real thought provoker, when you consider it has been a sponsor longer than Arrows, Benetton, Jordan, Sauber, Prost, Minardi, Jaguar and BAR have been in business. Some suggest that the Philip Morris brand will disappear as early as 2002, others that it will get a stay of execution until 2006. But whenever the tobacco company fin ally decides to say goodbye, it will bring down the curtain on a quite remarkable love affair with the sport. Since the split with McLaren at the end of 1996 brought to an end the longest-enduring tie-up between one marque and one sponsor, Marlboro has deliberately pulled in its horns. Gone are the lavish sub-sponsorships in Formula 3000 and F3, and in their place are more discrete associations, though Roger Penske's ChampCar team in America still races in the famous red and white house livery. Worldwide restrictions on tobacco advertising have inevitably begun to make their point. It remains to be seen whether the threatened withdrawal by 2002 is purely the by-product of financial negotiations with Ferrari in the year of Michael Schumacher's World Championship reign, but for many Marlboro's halcyon years were in any case those with McLaren. The shade of red paint used by Ferrari changed to a more orangey hue in 1996 to reflect Marlboro's increasing involvement with Schumacher and the Italian team, but nothing it has done since has ever stood out so graphically as the red and white livery on the McLarens. No other sporting relationship has ever enjoyed the level of achievement that made Marlboro's sponsorship of McLaren the most successful partnership in the history of Formula One Grand Prix motor racing. Between 1974 and 1996 Marlboro McLaren won nine World Championships for drivers; seven World Championships for Constructors; 96 Grands Prix and 77 pole positions. The team's colors became synonymous with success, competitiveness and engineering quality and excellence. It was a relationship without peer or parallel, and for 23 years it epitomized the perfect symbiosis of team and sponsor. The marriage of Project Four director Ron Dennis and McLaren Cars was engineered by Marlboro at the end of 1980. Dennis was already backed by Marlboro in F3 and was planning an ambitious move to F1 with a radical car designed by his partner, John Barnard. Meanwhile, McLaren, the team that had been established in F1 in 1966 by its founder, Bruce McLaren, had slipped down the greasy pole and was a shadow of its former self. Dennis had already approached Marlboro for support for his nascent F1 effort, and eventually commonsense prevailed. Dennis and Barnard would bring their promising project under the McLaren banner, as partners in a new team to be called McLaren International. Thus was a whole new dynasty born. Within months Dennis and Barnard had helped the team to get back on its feet, and when John Watson swept to victory in the 1981 British Grand Prix at Silverstone it was not just the culmination of their short-term dream. It also marked the beginning of a fresh chapter. Philip Morris had brought Marlboro into Formula One as a personal sponsor of the great Swiss driver Jo Siffert during the 1970 season when he drove for March. While he was driving with BRM in 1971, and leading the British back to glory, an agreement was reached that Marlboro would be the team sponsor for BRM in 1972. Sadly, Siffert was killed in the final race of 1971, a non-championship affair at Brands Hatch intended to celebrate Jackie Stewart's world title. The alliance with BRM yielded early success in May 1972 when Jean-Pierre Beltoise splashed to a dramatic victory in the Monaco Grand Prix, but after two acrimonious years Marlboro switched its support to McLaren which, ironically, had taken over BRM's Yardley deal. In 1974 the Brazilian driver Emerson Fittipaldi waged a gripping battle for the World Championship with Swiss Ferrari racer Clay Regazzoni, and Fittipaldi's eventual success also added the Constructors' Championship for McLaren to his own second Drivers' crown. Drivers' titles followed for James Hunt ('76), Niki Lauda ('84), Alain Prost ('85, '86 and '89) and Ayrton Senna ('88, '90 and '91), together with more constructors' championships for McLaren in 1984, '85, '88, '89, '90 and '91. No fewer than 96 of the team's 104 Grand Prix victories (to that point) were achieved in Marlboro livery. In addition there were 77 pole positions. In the glorious 1988 season Senna and Prost dominated the World Championship for Marlboro McLaren to such an extent that they nearly won all 16 races. It was only when Senna collided with Jean-Louis Schlesser while lapping him during the closing stages of the Italian Grand Prix at Monza, that the red and white steamroller from Woking was denied a clean sweep that would have been unique in the sport's rich history. Such was Marlboro McLaren's superiority that season that it took a simple human error to spoil the symmetry. "Philip Morris has been our staunchest supporter and a consistent contributor to our success over the years. We are, of course, disappointed that we were unable to reach an agreement," Ron Dennis said when news of the separation became official. The simple truth was that Marlboro could not carry on supporting two top teams, and preferred Ferrari because of its worldwide historic associations. It was John Hogan, Philip Morris' vice president of marketing, who first had the foresight to bring Dennis and McLaren together. "Way back in the early Seventies," he recalls, "we were a fairly small company but saw an opportunity. 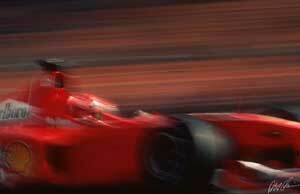 The sport has grown over the years from only 10 or 11 Grands Prix in a season to what it is today." As Marlboro became number one, McLaren's success on the track matched its success in the market. Hogan gives credit to the sponsorship but is obliged to be cautious by the increasing anti-tobacco lobby. "Obviously, there are many contributory factors. Sponsorship is only part of the mix that has contributed to Marlboro's leadership position." It is patently obvious that the link between Marlboro and McLaren represented one of the sport's greatest alliances, possibly its greatest ever. There may be red and white racing cars in Formula One in the future, but none will evoke such memories of competitive spirit, hard success and engineering excellence as the Marlboro McLarens that made history. When the checkered flag fell in Suzuka to end the Japanese Grand Prix on October 13 1996, a great era of collaboration between a team and a sponsor Came to an end. Before long, be it two years or four, the same thing now looks set to happen with Ferrari. When Marlboro finally leaves, F1 truly will have embraced the era of political correctness.